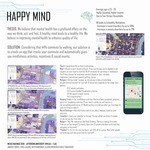 "Happy Mind" by Bailey Bourgeois, Erica Jacobs et al. Center City is home to a vast majority of overworked 30 year old's with limited social lives and high stress levels which causes mental depletion and higher anxiety. Our solution to this problem is a mindfulness app for mobile phones that this specific group can participate in. The app would not only give you advice on your commute to work, but also give you invites to nearby social events and discounts to a number of stores in the area. Bourgeois, Bailey; Jacobs, Erica; Wisneski, Allison; Torres, Amanda; and Makkonen, Antii, "Happy Mind" (2018). Nexus Maximus. 30.